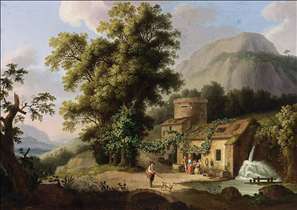 German landscape painter, active in Italy from 1768. 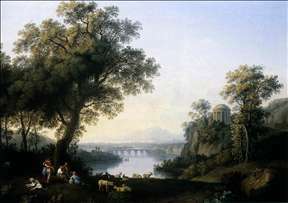 He studied in Berlin under the French painter Le Sueur, who taught him in the classical Baroque style of Dutch landscape, but when he moved to Rome he became one of the "Roman Germans" to turn to Poussin and apply the Neoclassical principles to landscape painting. In 1786 he became court painter to Ferdinand IV of Naples. 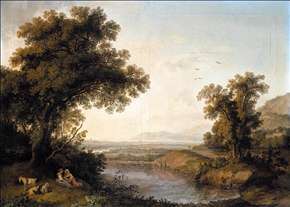 He was a sensitive upholder of the ideal landscape tradition of Claude, which he seasoned with touches of Romanticism . Much of his prolific output was devoted to views of famous sites, which were eagerly sought by foreign visitors to Italy. 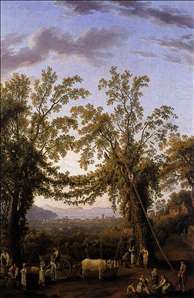 He came a family of artists and often collaborated with his brother Johann Gottlieb Hackert (1744-73). Goethe met Hackert in 1787 and wrote his biography in 1811. 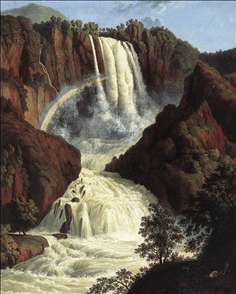 See more details about "Autumn"
See more details about "Italianate Landscape"
See more details about "Landscape with River"
See more details about "View of the Copper-Mill in Vietri"
See more details about "The Waterfalls at Terni"